My parents had come to Singapore last week and I felt happy taking them out for sight seeing. My mom has stayed back to help me out and spend some time with me here because I was kind of feeling bored and lonely being away from home. So it has been a little difficult to sit with the laptop and work on my blog and sorry for the erratic timing of the posts and I have not had time to check out my other friend's blogs as well and kindly excuse me for that. Something that always runs out in my vanity is my black liquid liner and currently, I am into this budget mode and hence refraining from buying expensive products. The local market here has a lot of products from Korea & Japan and in that specifically, I have been hearing a lot of positive reviews about the brand KATE TOKYO. 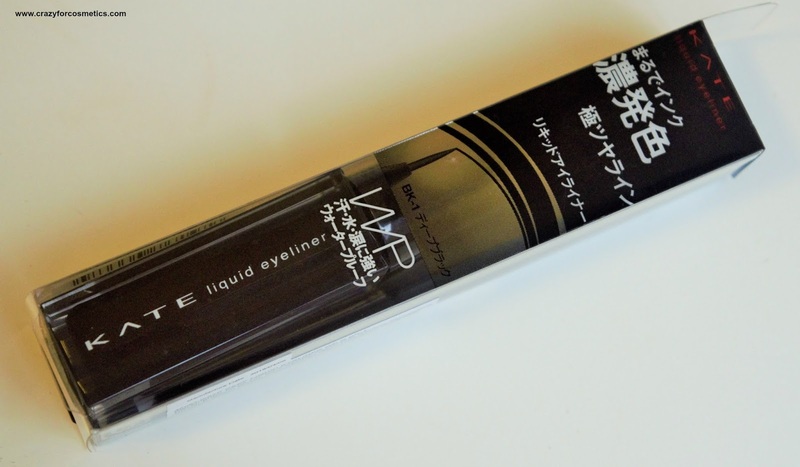 I have here a black liquid eyeliner from the Kate Tokyo brand for review. Strong coloration like an ink. The packaging is quite simple but I love the shape of the bottle which is quite different from the usual liquid liners. The outer packaging has everything written in Japanese but all you need is the name of the shade and hence, I boldly picked up the black shade. The brush is really lightweight and the bristles are thin and really good for drawing a fine as well as a thick line. It just takes a minute to finish lining both my eyes and the line is really precise. 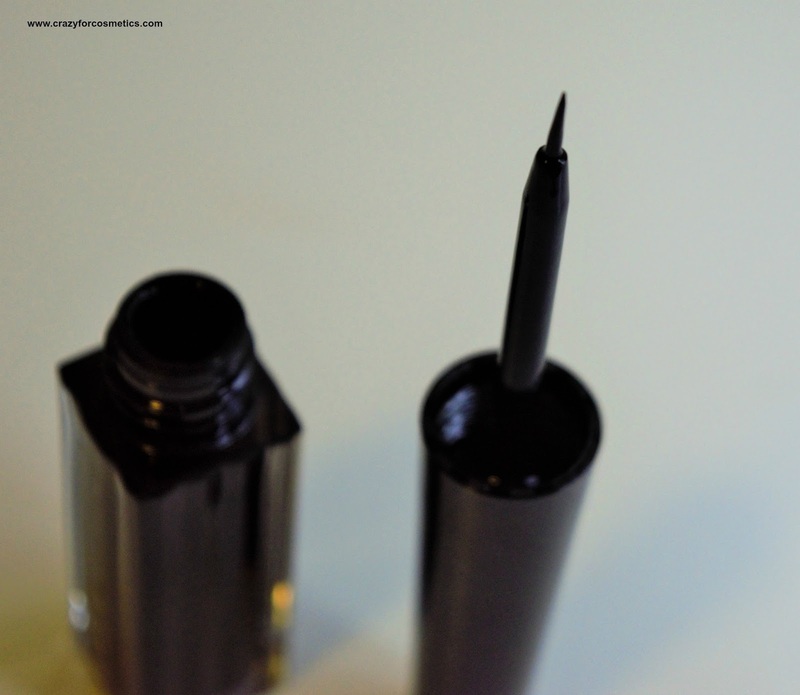 The texture of the liquid liner is quite thin and runny which helps you to easily draw a thin/thick line. The eyeliner takes some time to dry up completely on the eye which is a small drawback. 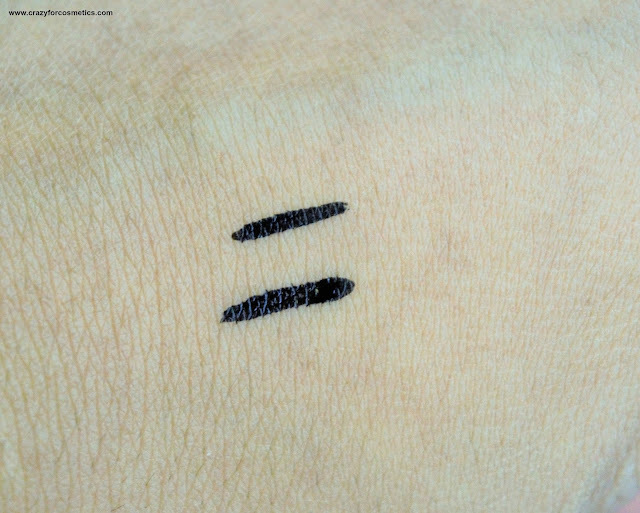 The liquid liner delivers a jet black shade and the finish is kind of matte but does have a teeny weeny bit of sheen to it. The eyeliner stays intact for about 4 hours after which it starts to peel into tiny bits which is really disappointing. 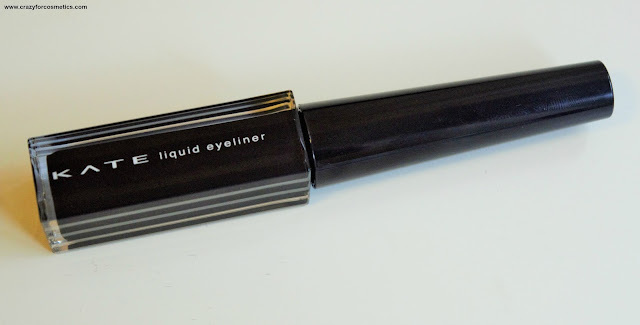 It starts smudging slowly and kind of disappears after about 6 hours for me which is considerably less time compared to other liquid liners in the market. It does not irritate my eyes in any way but I am quite disappointed with the staying power. It cannot be washed off with water and it satisfies the waterproof claim. Removal of the eyeliner is not that easy and when you try washing with face wash, it gets removed as flakes and sticks to your upper eyelid and hence, needs a proper eye makeup remover to be removed completely. Price: SGD 20 after 20 % discount. 3: A versatile brush that can be used for a fine line as well as a thick line. 1: Smudges & flakes away easily after 4 hours. Recommendation: I will not recommend this eyeliner since it can easily flake away and disappear in about 5 hours time and require you to reapply.